Tianya Haijiao, Tianya Haijiao Travel, Tianya Haijiao Pictures, Sanya, Hainan Island, China. Tianya Haijiao is a vast beach facing the South China Sea. Sitting on beach, you will see the boundless sea meeting the blue sky in the faraway horizon. Ancient people in China believe that it is the end of the earth there. There are numerous rocks, with different size and shape, scatter along the silvery beach. The largest two among them, respectively engraved with Chinese characters "Tianya Haijiao" (literally "the end of the earth"), are the most famous ones. According to legend, once upon a time, a young couple form two hostile clans fell in love and ran away. They ran and ran, until they see the endless sea and sky here. And they thought this was the end of the earth. It is right here, at "the end of the earth", that they swore their love--forever faithful and never separated. Constantly pursued by troops from both clans, they were forced to jump into the vast sea. People believe that the lovers later changed to two huge rocks, which stand facing the sea. Moved by the loyal love between the couple, today, many lovers come here to swear their love all over again. 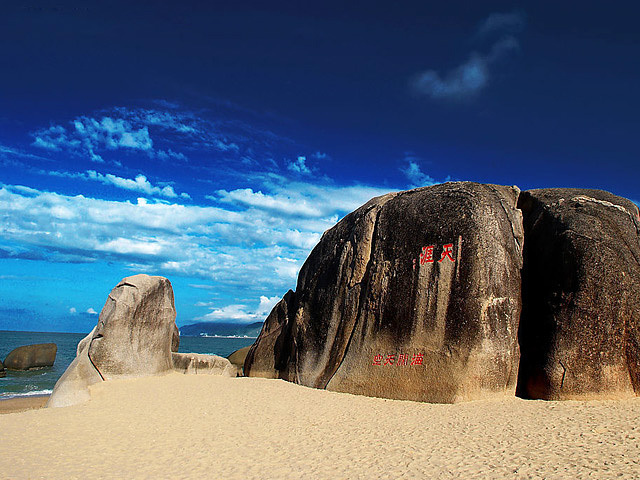 In addition to the romance, Tianya Haijiao is also famous as a natural beach. 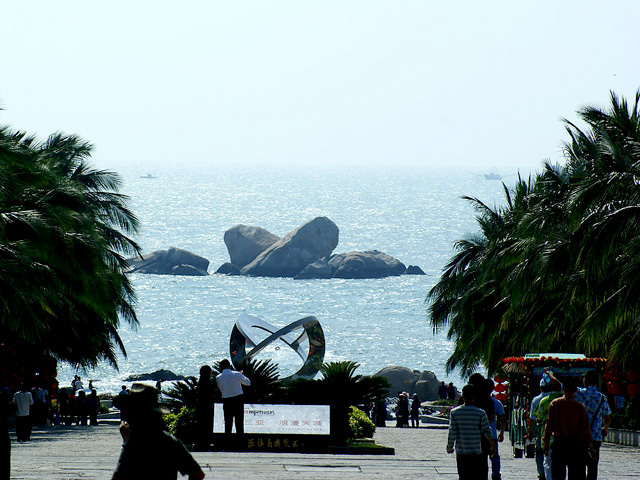 A seashore pathway, and a seaside pavilion have been set up for the tourists to enjoy the scenery or take a rest. Golden beach, vast sea and boundless sunshine and blue sky, and above all, the gathering of lovers, are all here to form a fabulous picture.